Whether your cat should fear a snake or the snake should fear your cat depends on the snake. Humans are susceptible to a lot of myths about snakes. Lots of us grew up thinking they're slimy, dangerous, all poisonous, scary ... some psychology "experts" even claim fear of snakes is inborn. Turns out this isn't true for you ... and it's definitely not true for your kitty. Cats love to catch, kill and eat racing, wriggling things. Small snakes fit this bill perfectly. This is especially true if the snake is scared out of its mind and thrashing wildly in an attempt to escape -- extremely likely when cornered by a predatory feline. By small, in this case, we mean any nonvenomous snake about 6 feet long or less that's native to the U.S.
King snakes, garter snakes, corn snakes, rat snakes, even the significantly sizable bull and gopher snakes end up on kitty menus. It's extremely unlikely your kitty would show the slightest bit of fear of any of these snakes. Tropical constrictor snakes are another matter. Big ol' boas, pythons and anacondas can reach sizes greater that 15 feet and get thicker around than your thigh. Some of these guys swallow prey the size of lambs in captivity and antelope in the wild. Your feline friend would be an appetizer. Even boas and pythons 6 feet and under are sometimes capable of doing away with a kitty -- especially one who annoys or threatens them. Unfortunately for her continued health, your cat is unlikely to be afraid of these snakes, either. Although there are some anecdotal stories about particular cats who are nervous around particular large snakes, don't count on it. The most common dangerous snake situation for kitties is when outdoor cats mix with wild, venomous snakes. Your cat is intrigued by wiggling animals whether it's a good idea to chase and catch them or not, and with a venomous snake it's definitely a very, very bad idea. Snake venom and cats do not mix well. Of course, there are exceptions to any generalization. 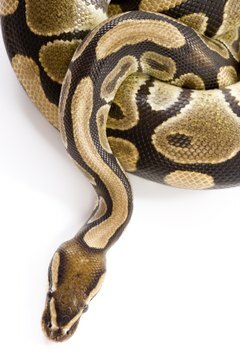 Many people who've had pet snakes and cats will tell you their reptile and feline buddies became the best of friends. This is possible, and there are certainly well-documented accounts of many unusual animal friendships. However, for the safety of your feline pal as well as any slippery, scaly neighbors, it's best not to take chances. Most snakes and all cats fill the same evolutionary rodent-and-bird-eating niche: they're natural competitors. Cats automatically take an interest in snakes that is usually unhealthy to one or both of them. Keep these animals out of harm's way by keeping them out of the way of one another.